A sensor is a mechanical device that takes in information and relays it to a human being in a different location. The rovers on Mars have a large variety of sensors to measure temperature, humidity, and the composition of rocks and soil. My front porch light has a light sensor on it that turns it on when it gets dark and off when it gets light. 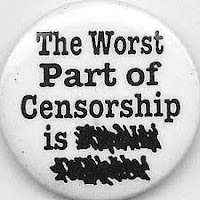 A censor is an individual who decides what may be written, broadcast, and said in public, based on the prejudices of the ruling class of a given society. A censor is also a metal ball used to burn incense in, and waved around, generally in a religious context. Keep them straight this way: Sensor is related to senses. A remote mechanical sensor takes the place of human senses, to a very limited degree. Both words start with an "s". Censor is either related to incense, or censorship...and all three of those words have the letters “cens” in them.